Written by bestselling author Saviour Pirotta, this fast-paced story is set in the Islamic Golden Age when Baghdad was the largest and most dazzling city in the world. Perfect for fans of thrilling adventure. Thirteen-year-old Jabir is hoping to save his family from being made homeless by finding work in Baghdad. Famished after his long journey to the city, Jabir is caught stealing bread and sent to prison. Luckily, one of the guards there notices that he has a gift for carving wooden models and he is released on the orders of the grand caliph Harun al Rashid himself. In return Jabir must carve twelve golden horsemen, a gift from the caliph to the emperor Charlemagne. But someone is determined to stop Jabir from completing the work and he will stop at nothing, not even arson, to achieve his aim. 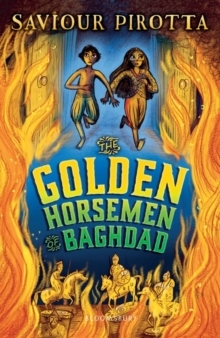 Can Jabir and his friend Yasmina finish the horsemen or will Jabir be sent back to prison?This exciting and readable adventure story is packed with great characters and insight into Islamic civilisation and the historic culture of the Middle East circa AD 900, a period which is now studied in the National Curriculum. The Flashbacks series offers dramatic stories set in key moments of history, perfect for introducing children to historical topics.